Forty years ago, during Mark Nizer‘s first juggling lesson, something inextricable sparked in his brain. He likens the rush to that of drug addicts. When he began his juggling and standup comedy routine in college, Nizer collected about $15 per street show. But as he replaced ping pong balls for bowling balls and bowling pins for torches and machetes, he began raking in $1,200 in a single weekend. Now, at 52, Nizer has left his street performing days behind. His shows at performing arts venues are spectacles laden with fog, motion-sensor lasers, and propane tanks whizzing through the air. Audience members don depth-perception glasses, and Siri – the iPhone personal assistant – narrates his stream of consciousness. Previous jobs: I’ve never really had a job besides this, except for working at a lumberyard in high school. In college, I was a street performer. It was awesome; I was performing outside in a free space, with no rules or regulations. Do you miss that setting, compared with the limitations of performing on stage? I’m basically a street performer cleaned up for the stage. Your mentors: I watched Michael Davis a lot, the first juggler ever on Saturday Night Live. I also toured with Bob Hope and opened for Ray Charles and George Burns. What catapulted you from performing on streets to opening for Ray Charles? Somebody videotaped my performance at a college talent show and sent it into the American Collegiate Talent Showcase. I then won first place in the International Juggling Championships, and was named the Comedy Entertainer of the Year in 1998. When traveling for a show, you don’t leave home without: My iPad and laptop. I plug into the light plot and sound system with my laptop and run everything remotely from stage. You’re fueled by: Sitting and playing. Mega playtime is critical to coming up with stuff. That’s what we don’t do enough in our lives. That’s how I came up with using Siri’s voice to narrate my show. Most dangerous items you toss around: I juggle an electric carving knife, bowling balls, propane gas tanks, and lasers. None of that stuff is difficult for me – it happens in slow motion. But fire marshals require that my clothes be treated with a flame retardant. Who taught you to juggle? When I was in seventh grade, my mom was sick of three teenagers lying around the house, so she signed us all up for juggling class. As soon as I started, something turned on in my brain. I started practicing 10 to 12 hours every day. Best part of your job: Seeing the world and playing with it, figuring out what works, what doesn’t. Forced creativity can be painful, but it forces you to stumble upon things you otherwise wouldn’t have. Most challenging part of your job: It’s exhausting having to say Look at me! all the time, trying to get hired for shows. It’s also hard to come up with brand new ways to play with balls and bowling pins. Every day, some kid in Denmark or Africa is thinking of new ways to play with them, and it spreads around the Internet like wildfire. What would people be surprised to learn about your job? Some tricks take years to develop. And some are disasters. I once built a laser harp with fake laser beams that plays music when it senses your fingers. But it was impractical, and weighed hundreds of pounds. So now I have a bunch of lasers, worth thousands of dollars, sitting in my basement. Number of shows per year: About 120. Your most impressive trick: There’s one I call the Impossible Trick. You spin a ball on your right index finger, and another ball on your right foot. You throw the ball [the one spinning on your foot] to your forehead, let it roll down your neck and back, and kick it with your heel so it goes over your head and lands on top of the other ball spinning on your finger. I worked on that trick for seven years before I could get it to work one time. It took another three years before I started performing it. Where do you practice? Any open space indoors with a high ceiling. For shows, I need a space with a 12′ ceiling or higher. Blackout capability is nice for the lasers and other special effects, but not required. What are you working on now? I’m into hang gliding right now, and I’m messing with metal tubes a lot. I also want to use my two big air circulators to make things fly. One trick you can’t seem to master: I’ve been trying forever to use a new camera that can sense body position. There’s also this dimension beam that uses infrared light to sense body position, which I’ve been trying to use without much success. Salary: Per show, I charge anywhere from $1,000 to $15,000. People say that you don’t need to a college degree to do what I do. I disagree. Economics, marketing, and advertising classes will all help with positioning yourself as a performer. NEXT: Meet the millionaire’s magician, another No Joe Schmo who will make you question your eyes. By the way, in case you were wondering: Mark Nizer wasn’t totally crazy during his first juggling lesson, when he felt something “turn on in his mind.” It’s true: learning to juggle stimulates an unused part of one’s brain. 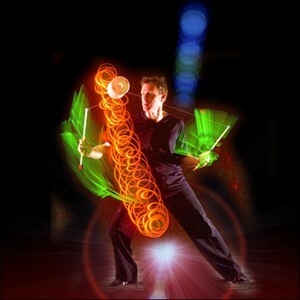 This entry was posted in Cool jobs, Crazy jobs, Small Business and tagged how to juggle, international juggling championships, juggling, juggling torches, juggling tricks, laser shows by Megan Hess. Bookmark the permalink.